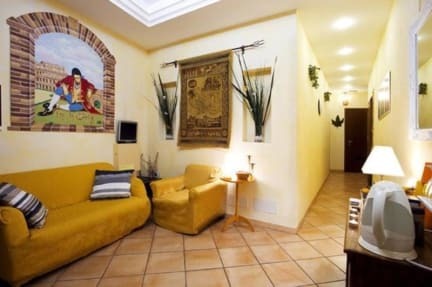 Gulliver's Lodge is a charming alternative to a traditional hotel in the center of Rome, the Gulliver's Lodge is a family-run guest house, warm and welcoming place for families and couples on holiday in Rome. The pretty Gulliver's Lodge offers rooms with an exceptional quality / price ratio and is just a few minutes from the main attractions of the city. The soundproofed rooms are individually decorated with shades that recall the bright colors of spring. The rooms are cleaned daily. All rooms have private bathroom, minibar, hair dryer, sockets multi-voltage, LCD satellite TV, DVD player, direct dial telephone, air conditioning, and electronic safe, free WIFI connection. After check-in you will receive the keys and there are no time limits, always in the respect of our other guests.